A new agreement signed between St. Francis Xavier University and a Chinese educational delegation will strengthen the two countries’ scholarly exchange as well as enhance StFX recruitment in China. 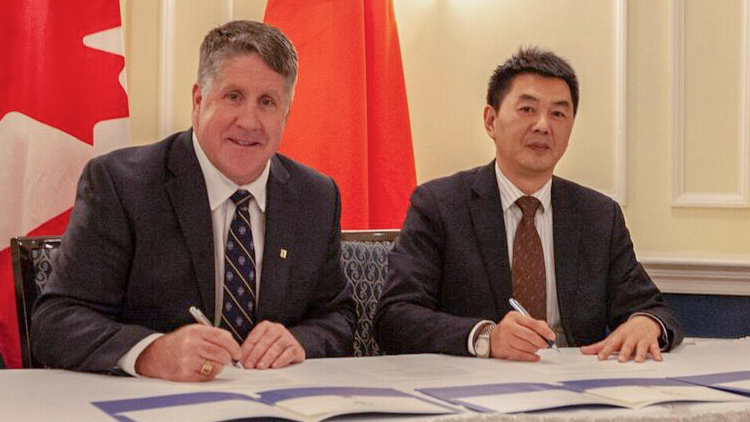 The agreement was signed by StFX President Dr. Kent MacDonald and Mr. Guo Wanjun, Director of the Education Bureau of Qingbaijiang. The agreement will allow for new opportunities for recruitment and encourage visiting scholars and faculty to look at other possible areas of cooperation in research and academic programs. Joint conferences, seminars, workshops and forums are other possibilities for this new relationship. Mutual beneficial opportunities in international education will strengthen the bond between Canada and China and support faculty and students in fulfilling their academic pursuits across borders.